Each year growing up, my family would all sit around my grandmother's table for Thanksgiving, It was covered with a beautiful table cloth, and her fancy china. My grandfather would carve the turkey. Mashed potatoes would be kept warm on the stove next to the sweet potatoes. There would be corn and sometimes beans or carrots. Oh, and I can't forget the stuffing, cranberry sauce and gravy. In the evening, cousins and other relations would gather at our house for turkey sandwiches and desserts. Part of the dessert table would always include an ice cream sundae bar. We'd play board games and laugh the night away. When first married, I lived far away from my family. Attending those family functions wasn't possible. I made my own Thanksgiving dinner for Jason and I. We always found someone to invite to come over and join us. Then our kiddos came along. 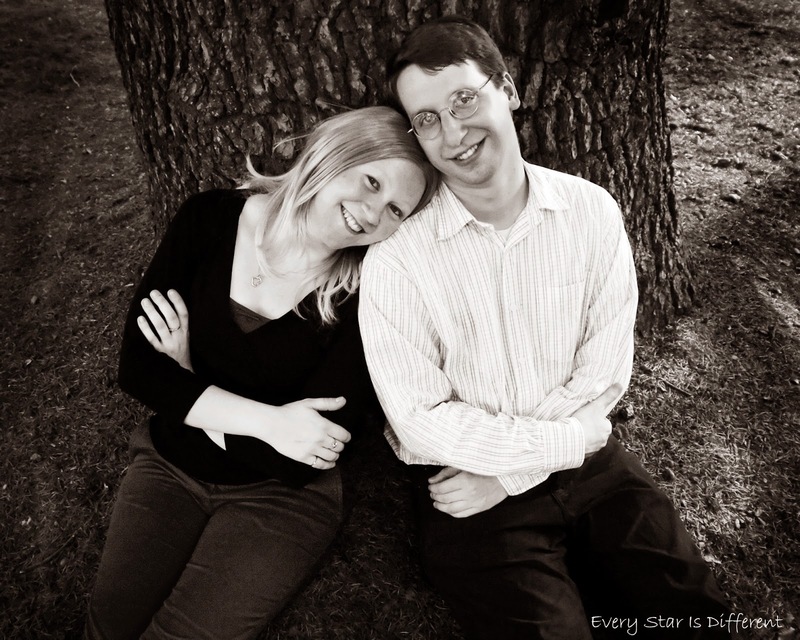 Thanksgiving is the HARDEST holiday ever, when accommodating special needs. If autism and RAD didn't make things difficult enough, the food allergies make the holiday a nightmare. After all, the entire holiday is about food! I started agonizing about Thanksgiving months ago, dreading the whole thing. At first I thought the best thing to do would be to go on a vacation. The only problem was, Jason works the holiday, so it's not really possible. I started asking friends and readers for ideas. This is when I learned about The Giving Tree ThanksGIVING from my friend Tiffany. The Giving Tree ThanksGIVING is a tradition she has in her home with her own children. Instead of focusing on the Pilgrims and Native Americans or a big feast, her family spends the day GIVING. She plans family service projects that everyone can participate in. Service ends with planting a new tree. They put their Christmas tree up at night, and then gather around the tree and read the book, The Giving Tree, by Shel Silverstein. When I heard about this tradition I instantly fell in love with it and asked for more details. After all what better way to show thanks than to give to others. I LOVED the idea of reading such a fabulous book as part of the day too. This year will be the first Eddy Family Giving Tree ThanksGIVING. Since the kiddos are still little, our service won't take all day, but I figure spending the morning in service will be a great start. Everyone is super excited about planting a tree in the backyard too. We will still have Thanksgiving Dinner, as the kiddos are actually excited about it this year, but it won't be too elaborate. Then after dinner, instead of putting up our Christmas tree (It's already been up for two and a half weeks now. ), we'll be putting together our Random Acts of Christmas Kindness Countdown Tree. I think it's quite fitting for the day. Finally we'll end with one last reading of The Giving Tree. Since our theme for the month is "I'm Thankful For Family," I'm trying to focus on service related to our family. 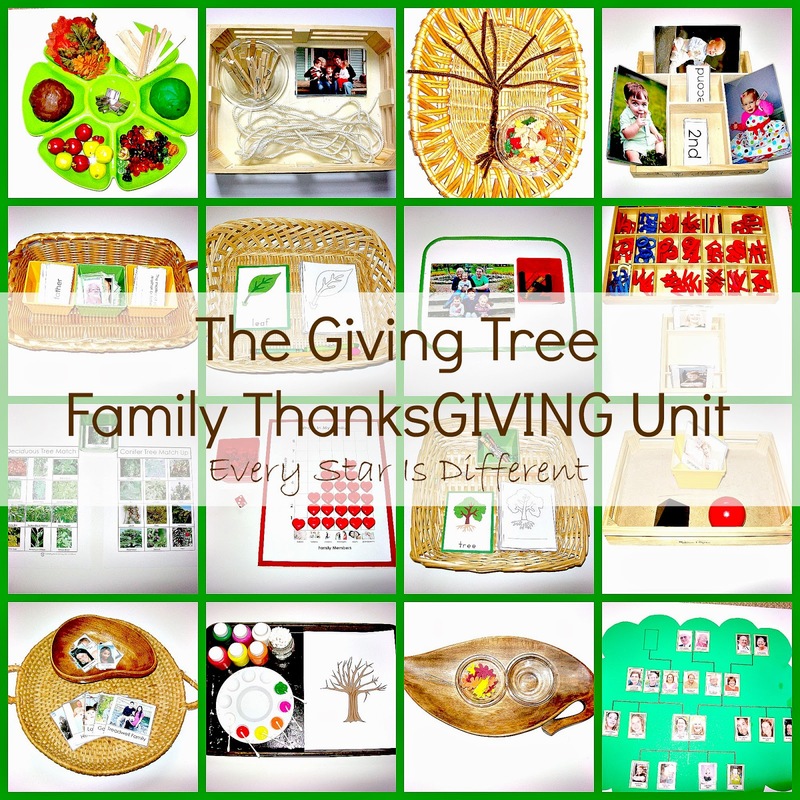 This week's learning time activities are a combination of those related to our family and trees. I thought this would be a great kick off to our first Giving Tree ThanksGIVING! I hope you enjoy! 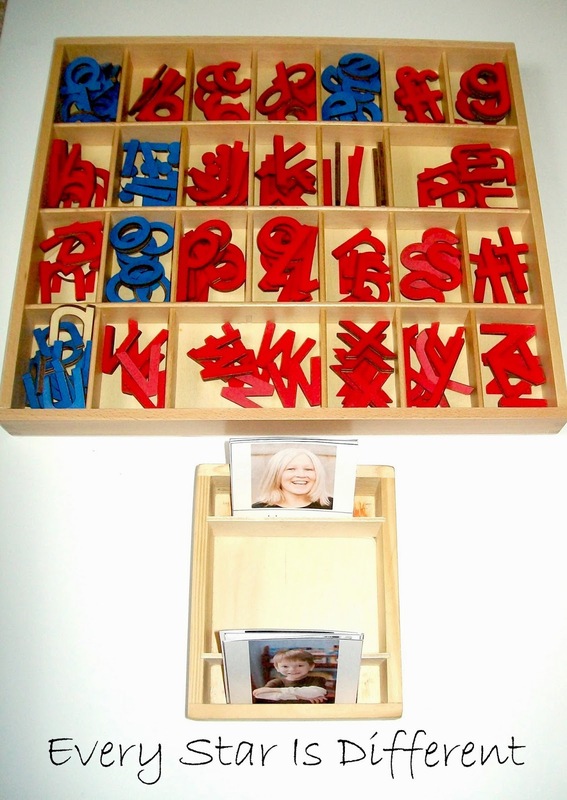 The kiddos will practice spelling the names of everyone in our immediate family. They will also practice spelling father, mother, sister, brother, and family. 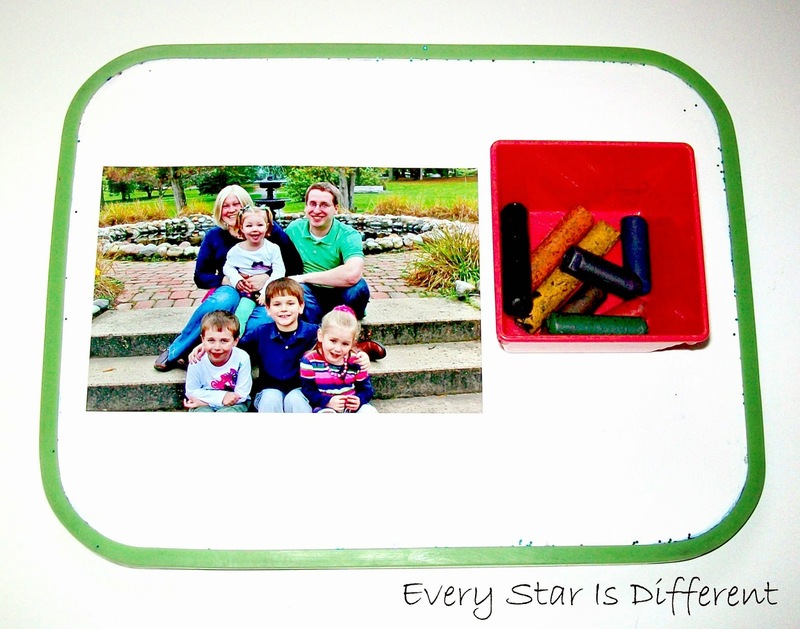 Source: I created the printable for this activity as part of my Family Unit Printable Pack 1. For your free copy, click on the link at the bottom of the post. 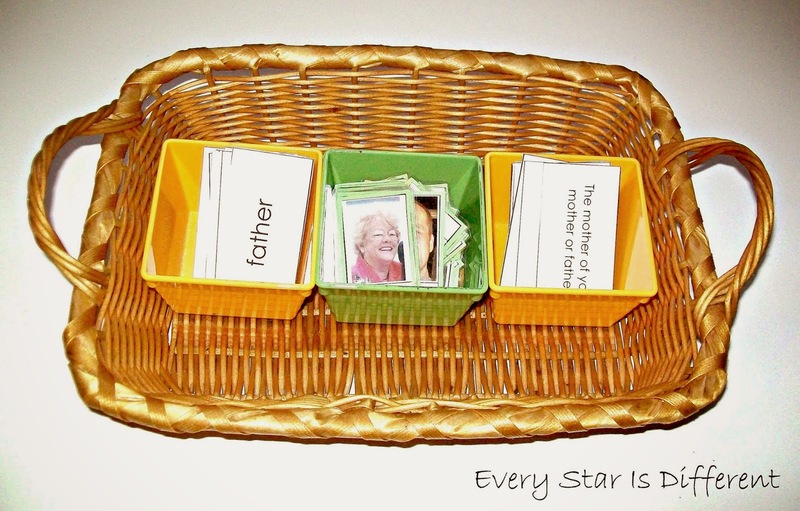 In this activity the kiddos will match up family member titles to definitions. Once they've done this they can sort family members and place them under the proper titles and definitions. 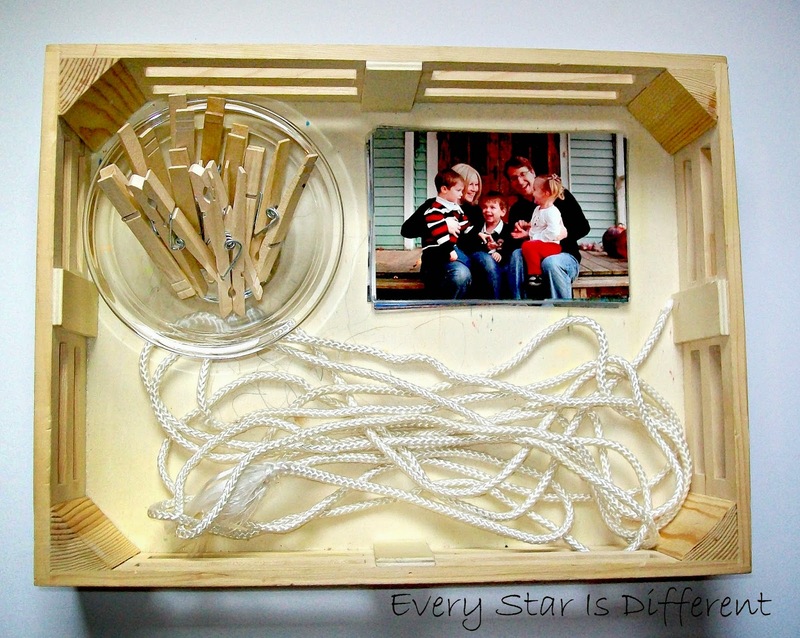 This activity seemed a little challenging for the kiddos at first, so I'm guessing we'll be doing it together at least one more day, before they venture to do it on their own. We've done this activity in the past. The kiddos LOVED it. If it's possible, the kiddos enjoyed it even more today, a second time around. In this activity, I've included a picture of each kiddo for every year of their little lives. Their job is to put the pictures in order from youngest to oldest and then place the correct labels below each picture. If they're feeling up to a real challenge they can sort all of the pictures, not just their own. 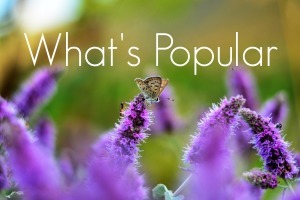 The kiddos will put together a graph of all of the individuals in our family, putting them into groups of babies, toddlers, children, teenagers, adults, and grandparents. 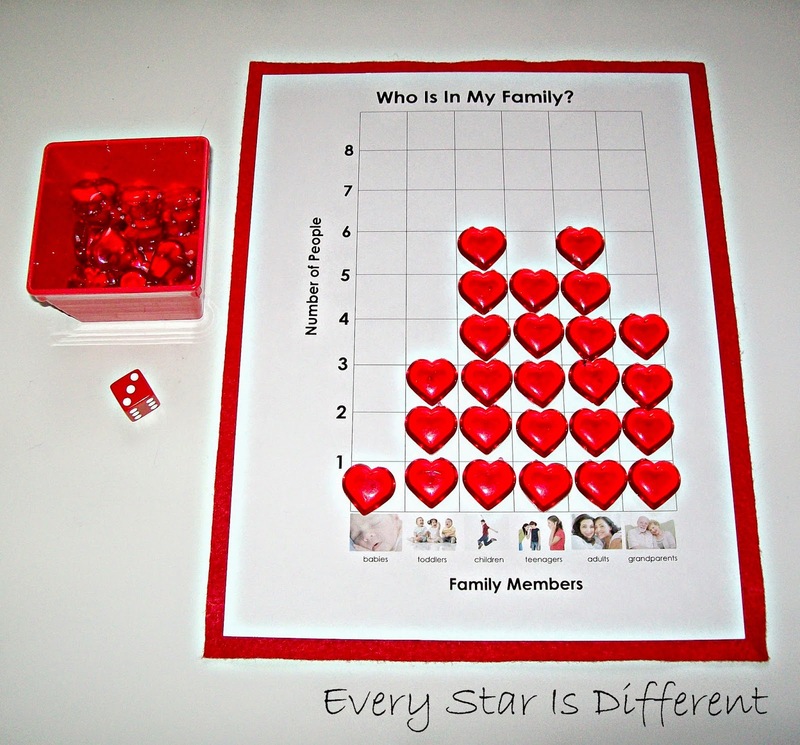 One can graph their real family, or use dice to create imaginary families. The kiddos will sort individual extended family members by family, so they learn which cousins belong to which aunts and uncles etc. We've done this in the past and it was a favorite activity. We've done this activity in the past also, but it's always great to review. 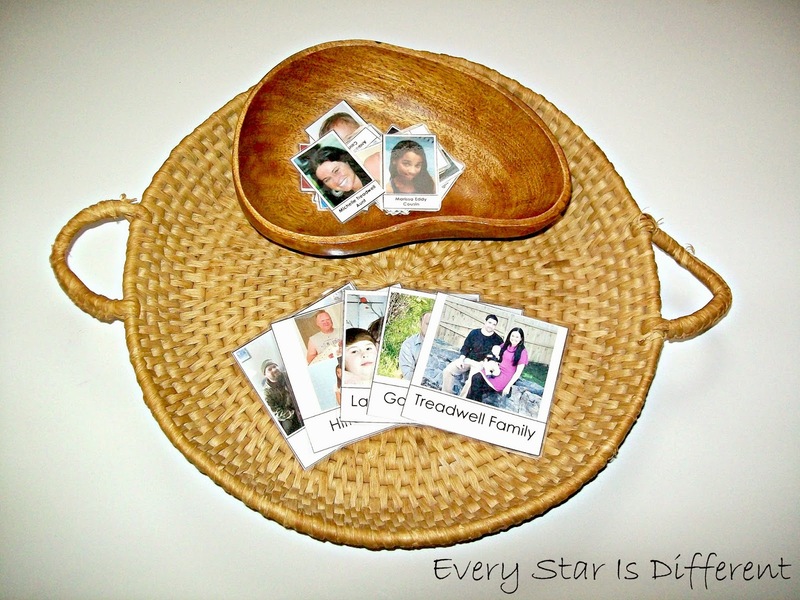 The kiddos will build their family tree using the pictures provided. I created this tree using family members who are living. Sadly, Jason lost his Grammy over the last year, hence the missing photo. The kiddos are so blessed to have so many great grandparents still living, and so many sets of grandparents that love them. The kiddos will color and then label the parts of a tree in their own little books. All of them have thoroughly enjoyed this activity. Even Bulldozer has done it! 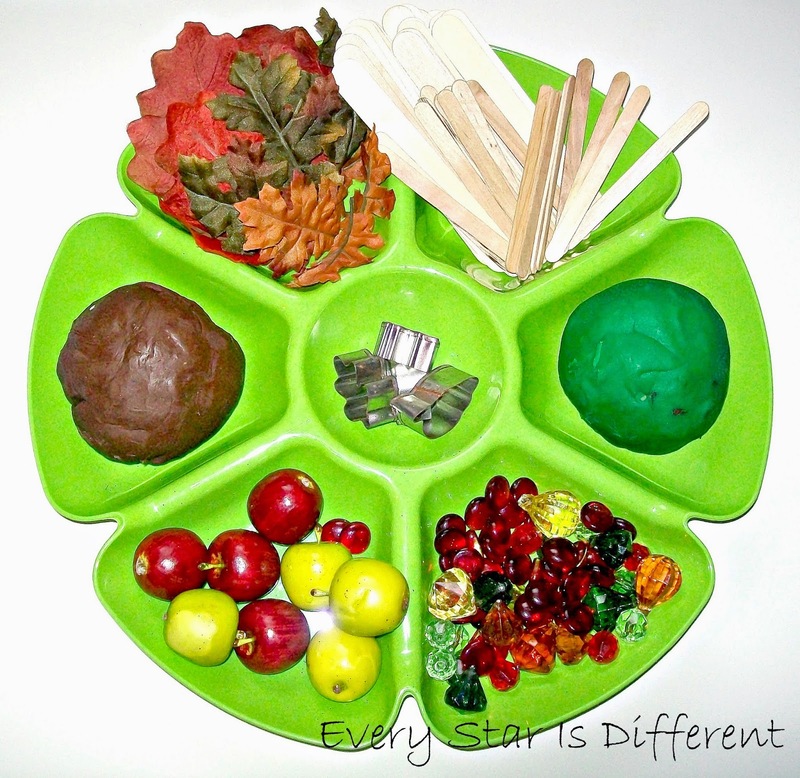 Source: The printable for this activity can be found at Trillium Montessori. 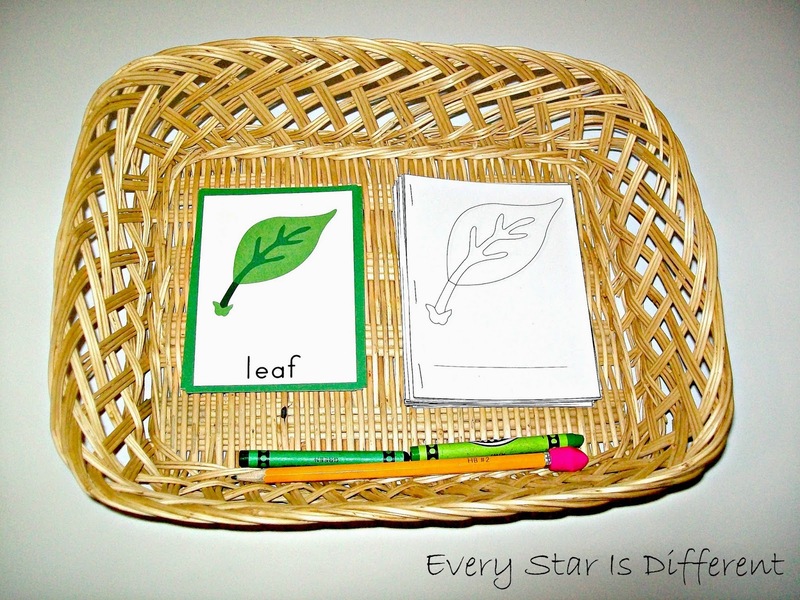 The kiddos will create their own books, coloring and labeling parts of a leaf. Just like the tree book, this has been a big hit on our shelves this week. Last year, the kiddos did each of these match ups, but at different times. This year we're doing them as a combined activity. 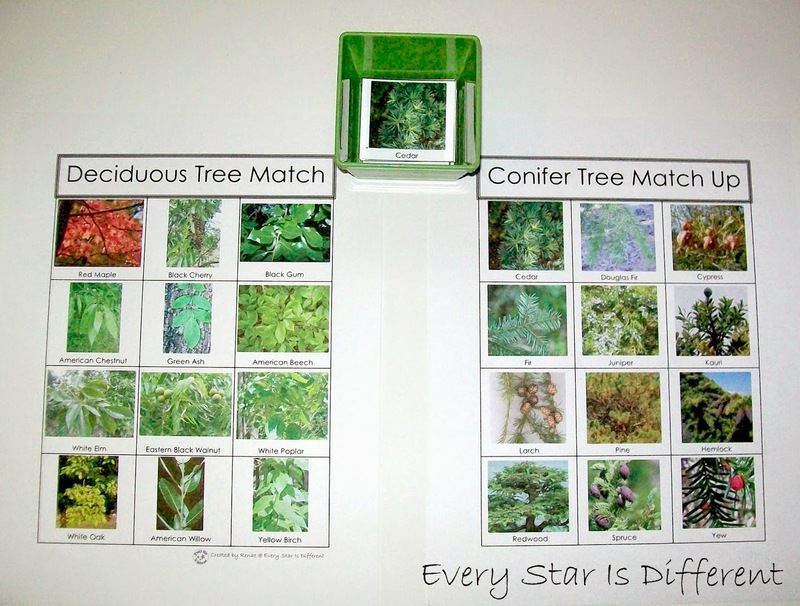 The kiddos sort and match the different types of trees in the pictures. 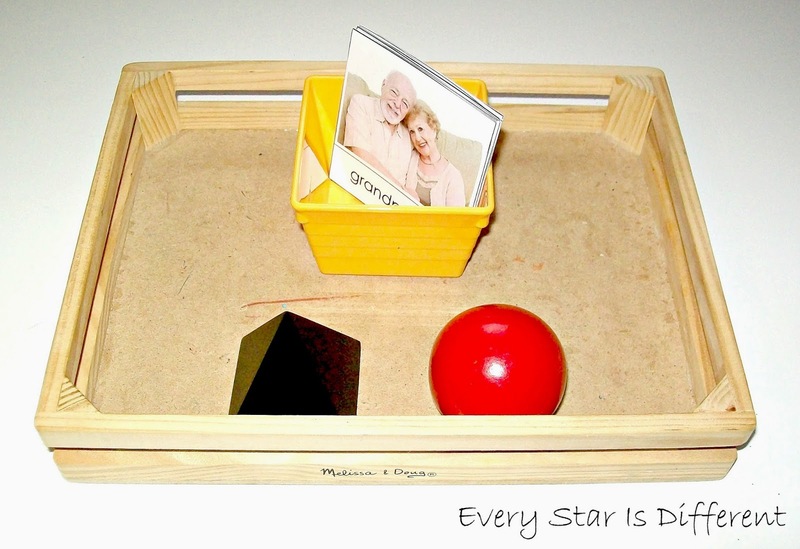 Source: I created the printables for this activity. For your free copies, click HERE and HERE. 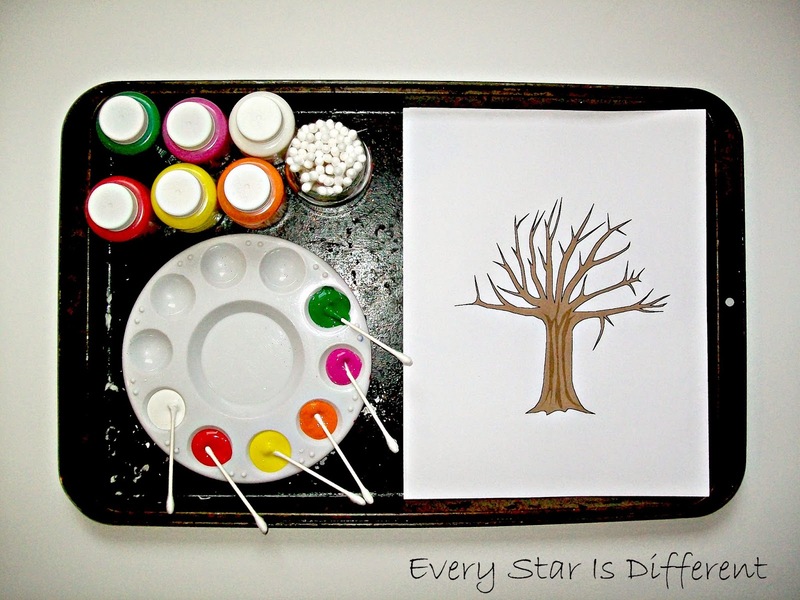 Before doing this activity, we reviewed what a tree looks like during the different seasons. The kiddos will use Q-Tips to create a tree for each season. They've really enjoyed this activity and are choosing different kinds of trees, which has been really fun. Source: I found this activity at Mess For Less. 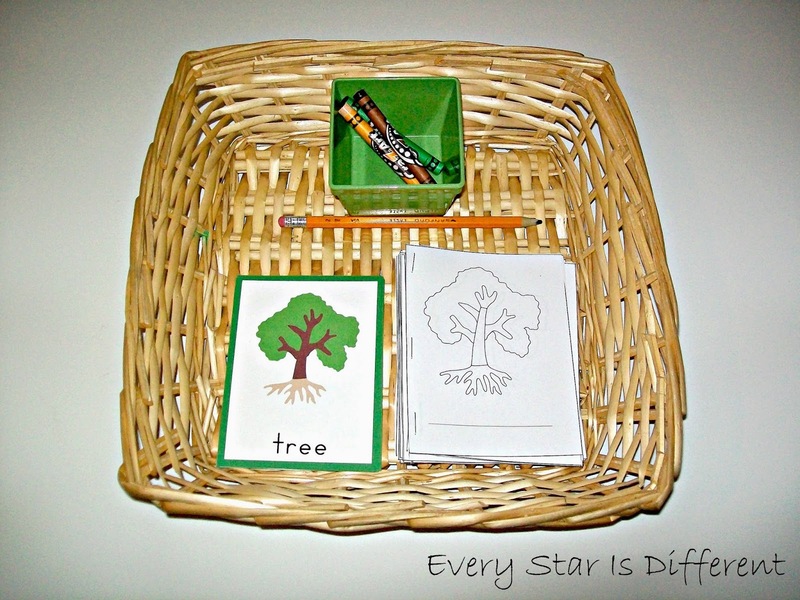 The free tree printable I used for the activity can be found at DLTK Growing Together. One of the kiddos' favorite things to do lately has been to draw pictures of their family. I thought it might be fun to include a photo of us for them to use as a visual, and see just how detailed their drawings can get. "This is the sound of the bell at the Ferris Wheel. This is the sound of the bell when riding the carousel. This is the sound of the bell on The Polar Express movie." He continued with almost every bell. At first I just thought he was playing, but then listened to the bells he was choosing and sure enough, the pitches were accurate, and if not, they were just a half step off. I do believe Bulldozer may have perfect pitch! He doesn't know the names of his notes yet, nor is our piano in tune, so the only things he could compare the bell sounds to were other noises he had heard. I must say I'm one proud music Mama! The kiddos continue to practice the piano. Princess did fabulous today, once I wrote the note names above the notes for her to read. She's so talented in so many areas. I kept having visions of her playing masterpieces on the piano. I just love this activity. The kiddos do too. The glass bowl is filled with leaf buttons that the kiddos string on to the pipe cleaner tree branches. The tree looks beautiful once all the leaves are on. 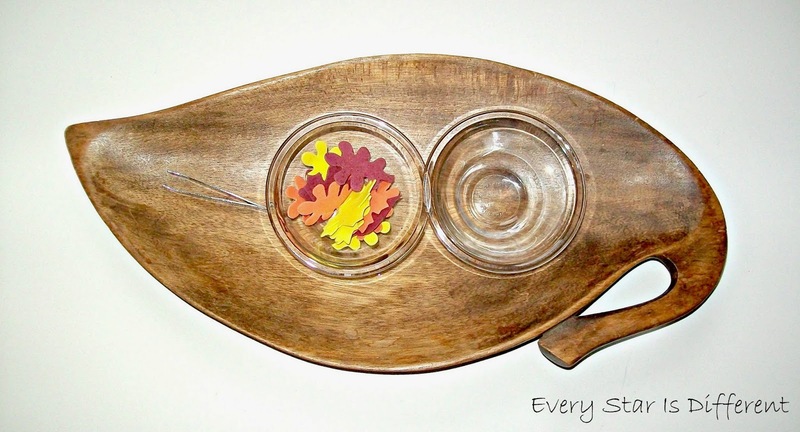 The kiddos will practice their fine motor skills by tweezing these tiny foam leaves, transferring them from one bowl to the other. What's not to like about a clothes line filled with family photos from the present and past? I've laminated the photos, so they're thicker and stiffer, making them hang more easily. The results are beautiful and such a fun decoration! I couldn't resist including an invitation to play on our shelves this week. Besides enjoying it during learning time, it will be a great activity to occupy the kiddos, while I'm trying to fix Thanksgiving Dinner on the big day. For those of you interested in the free printable pack, click on the link below! 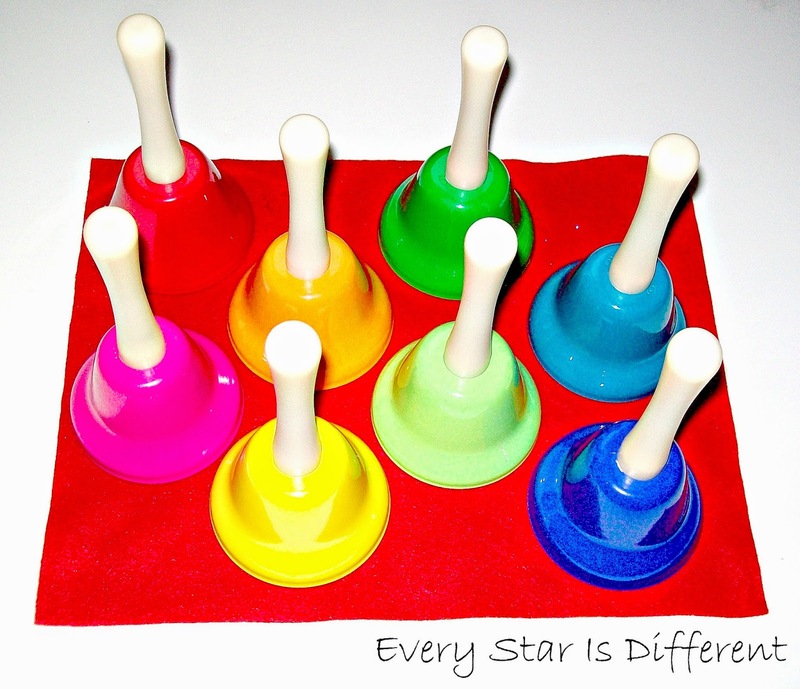 Next week we'll be starting our month long Christmas Unit with a week's worth of activities all about bells. I hope you have a very Happy Thanksgiving if you are celebrating! What a wonderful unit! I love all the ThanksGIVING ideas too. Such a great way to emphasize the beautiful part of the holiday (and to hopefully not stress too much about food issues). Hope your family enjoys a wonderful Thanksgiving! So many great lessons here! Thank you so much for stopping by the Learn & Play link up! Your post is featured this week on Christian Montessori Network. 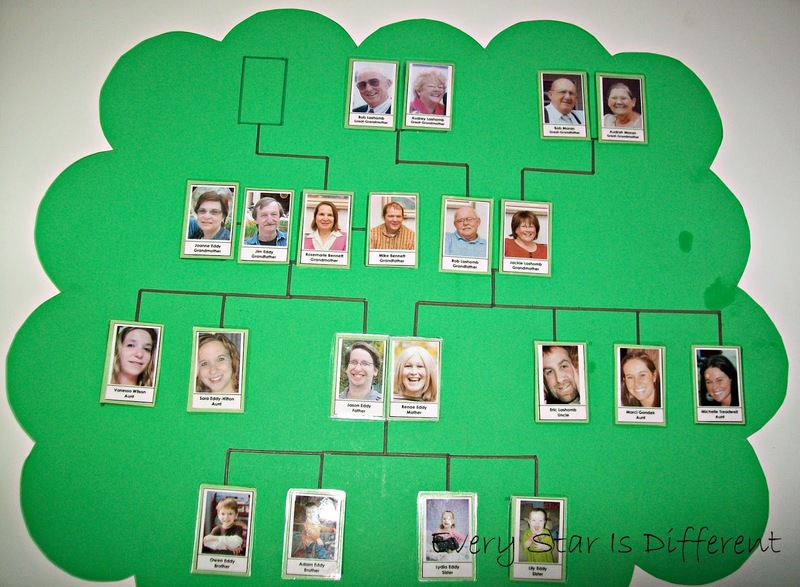 The family tree and sequencing family pictures are my favorite activities! 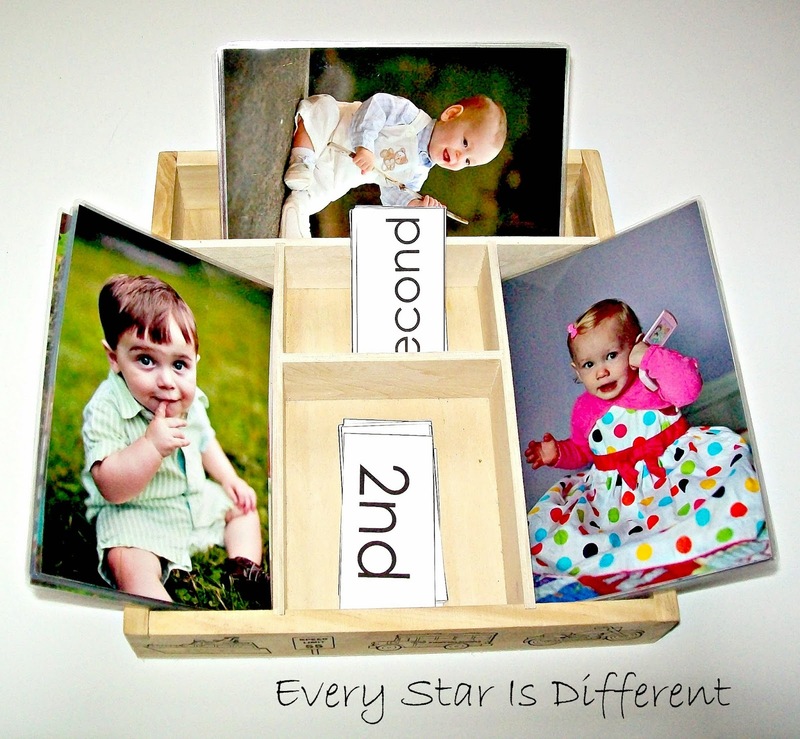 I know Little Bee would love the sequencing pictures. Great idea! This is awesome!!! So many great ideas. Love this! We just had a Tree Unit for Vito but still too young for these, but will definitely be coming back next year for toddler ideas. Thank you!